Before the official announcement of Ice Cream Sandwich running 3rd Google Phone we known it as Samsung or Google Nexus Prime. But since its official press appearance we knew it as Samsung Galaxy Nexus. 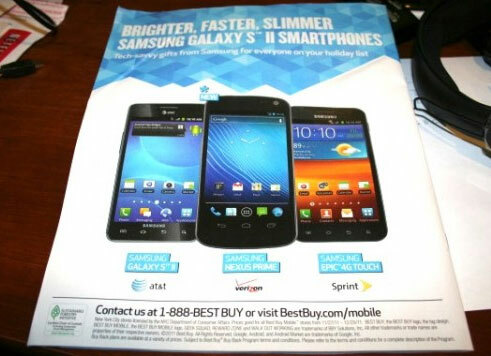 But from the leaked Best Buy image we are now sure that in US, Samsung Galaxy Nexus will be known as Verizon Samsung Nexus Prime. Earlier Google released an official video featuring a Verizon-branded Galaxy Nexus. It was more than enough to prove the third installment of the Google phone is indeed coming to Verizon's network. But we didn’t find any name there. The Nexus Prime will most probably hit the Verizon stores in a couple of weeks and should cost $300 with a two-year contract. In the mean time unlocked SIM free GSM version of Galaxy Nexus is already become available in USA for $750.